Joe Ferreri built a tower for College Station, the tallest tower between Houston and Dallas. His dreams went unrealized when it opened right before a recession, and just over three decades later (also in a recession), he helped destroy the tower you built and saw his creation, a 17-floor tower, crumble into a heap of concrete. That building was the Plaza Hotel, but it wasn't always that way. The story goes that Joe Ferreri was a successful restaurateur in town, and James Earl Rudder himself (long before getting a tower, a high school, a dormitory, and a freeway named after him, but after becoming a World War II hero) approached him with a business proposal. Rudder explained that he was having trouble recruiting faculty to A&M because professors’ wives thought the town was boring. The solution, Rudder proposed, was a hotel across from campus with an Olympic-sized swimming pool, a banquet hall and a faculty club. Ferreri wasn’t so sure. But the former Navy soldier said he knew he couldn’t say no. “When a general says, ‘Do this or this,’ you say, ‘Yes, sir,’” Ferreri said. Imagine seeing this beautiful sight traveling down Texas 6! Doesn't it look nice on a postcard? At the corner of FM 60 and State Highway 6, College Station's first chain motel (maybe? ), Ramada Inn, opened, complete with a tall, lit "Uncle Ben", Ramada's mascot. It delivered on all of Mr. Rudder's wishes and opened circa 1965. Replacing much of the Gorzcynski's Meadowland subdivision, the hotel thrived, eventually being the genesis of multiple hotels being opened on that part of Texas Avenue. When the Ramada was getting consistently full on a nightly basis, it had to expand, so parking was placed behind Meadowland (replacing more homes, of course) and a 17 floor tower was built in 1980-1982. The construction involved demolishing the east end of the hotel and enclosing the swimming pool under a huge glass skylight. The top four floors were sold out as loft-style housing to wealthy Aggie alumni, all of which got rich off of the oil boom. "I thought I was doing something for the city and the college by going up with the high rise to indicate that this is now not a town but getting ready to be a city. That is the image I was trying to create,"
College Station had survived the 1970s recessions and was quickly becoming a major city. The city had expanded well beyond the "far end of town" (FM 2818) and was quickly expanding south. In 1982 the city gained a modern (if small) shopping mall, and it seemed College Station would keep growing. In 1984, a Hilton opened further down University Drive. Beefeaters: The restaurant in Ramada in the mid-1970s. What exactly is "heavy beef"? All about this time, the oil bust came. Houston and College Station were hit hard. Jobs were lost. Banks closed. Real estate plummeted. Joe Ferreri lost practically everything he had in bankruptcy in 1987, including his hotel that he ran and managed. Ramada Inn ended up pulling the plug on the hotel and moving to an existing hotel further south on Texas Avenue. Ferreri ended up going back to restaurants and opened an Italian restaurant in the former Ira's in the Kmart parking lot. In fall 1989, the building was reopened as a combination hotel and upscale student dormitory. Gone was the Ramada Inn name, as the company was now in a smaller building further down on Texas Avenue. Rather than Joe Ferreri, control went to California-based financier Leonard M. Ross, who renamed the building (Ross isn't exactly loved or respected). UNIVERSITY TOWER shown from red neon to afar, but it soon fell into disrepair, partially because the hotel part disappeared more and more each year until finally becoming student dorms entirely in early 1994. Horror stories of students living in the tower are still whispered to this day throughout message boards and real life. Tales of no hot water or broken down elevators live on and you'll be hard pressed to find someone who lived in and enjoyed the Tower after maybe the first or second year it opened. Ross eventually converted more of the dorms back into regular rooms (with a gala in the top level suite, Buzz Aldrin as the guest of honor) and renamed the hotel as the Plaza Hotel & Suites circa 2004, which replaced the University Tower brandings with a large "P", but it just looked cheap and ugly. All during this time, Ross simultaneously hawked the site to the city in their quest for a convention center site while letting the hotel go to waste (it's worth noting, for instance, that Ross also owned the fourplexes at Meadowland, which were nasty enough to have the hotel at 104 Texas Avenue seal off its back entrance. 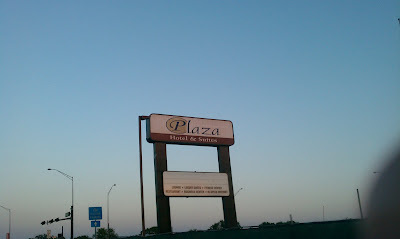 In 2007 (about three years after the Plaza name took over), a kid drowned in the swimming pool. In 2008, the kitchen scored a 47 on health reports due to no hot water, which almost never happens (in the University Tower days, it offered a cafeteria, which I bet was nothing worth talking about). After continued problems (and terrible, terrible hotel reviews) the hotel shut down for good in 2010 and sat abandoned for over a year. It started to get reports of vandals and trespassers, and eventually the windows on the top level suite were knocked out and had to be patched with plywood. In in late 2011 the hotel was sold off as the holdings of Ross went bankrupt. I don't know if he's sold off his $165 million mansion in Beverly Hills yet, but there you go. In January, the building was planned to be renovated once more as student housing, with the "design [being] complementary to the Texas A&M campus". But after some consideration: perhaps either what they wanted to do with the rest of the land, or the enormous cost it would be just to renovate it to make it up to code, much less make it attractive to students, so it was soon decided that the building would be flattened entirely, and it was announced that on May 24, 2012, it would be completely leveled. After donating the furniture (probably not the mattresses), recycling any material they could, and letting the police and fire departments use it for training, it was gutted, making the building resemble a parking garage (albeit a tall, narrow one) more than anything. Thousands showed up to the implosion, crowding the streets, making it there quite early (or in some cases, extremely late). It was a diverse crowd: students that stayed for the summer, families, the old and the young alike. After a ten minute delay, 6:40 AM was the moment the quarter-ton of dynamite in the upper levels detonated and the building crumbled to the ground, with one of the four people imploding it Joe Ferreri himself, along with the mayors of College Station and Bryan, plus TAMU chancellor John Sharp (can't resist a chance at publicity). People cheered, a massive dust cloud blew toward Bryan, and every car alarm in the public viewing area went off. Tons of videos were uploaded (the most views being someone dressed as the Joker, but the video was removed). Also, reader John E. of Southern Retail was in town soon after the demo and took a few shots of the tower, at least, what remains of it. Thanks, je! There's also a great video on YouTube on the history of the building and the backstory of Joe Ferreri. There's great period music too! After the last of the rubble was cleared away, the area sat as a muddy lot for the remainder of 2012. Of course, if you drive by today, you'll find new, huge structures on the site: Northpoint Crossing. Shorter, denser, and larger than the old Plaza, the former home of the tower has completely changed, along with the old Chevron, UtoteM/smoke shop, and Kettle in the area. It's unlikely that I'll cover Northpoint Crossing on this blog, but there's always a chance! 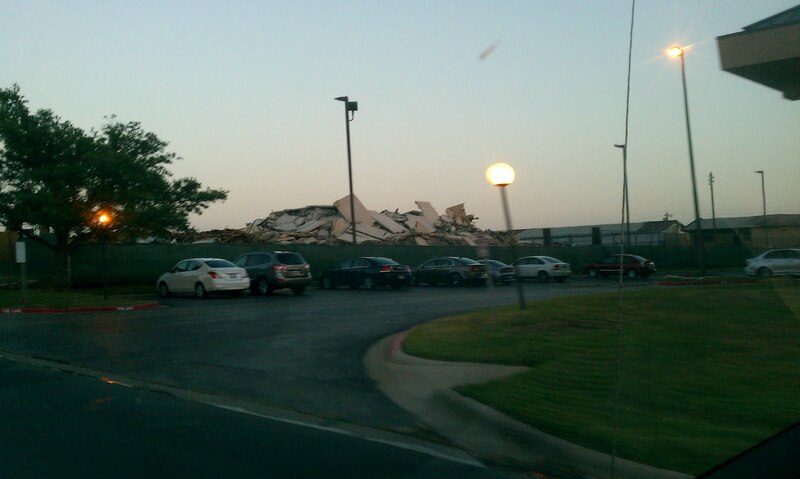 In a way, I'm a bit sad that the hotel had to go that way. Since the the Rise isn't an attractive building, I kind of wish University Tower had done something in the 1990s instead of letting it deteriorate. 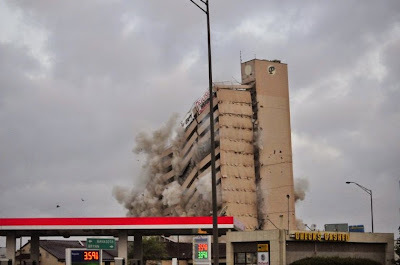 Rather than the boxy, "generic 70s hotel" tower (the former Holiday Inn/Days Inn/Heaven on Earth Inn in Houston had the same problem), they could've enclosed the entire building in glass, taken out the Gulf/Chevron on the corner of Texas and University, demolished the last of the original motel that wasn't part of the connected portion, closed off Meadowland Drive and turned the whole thing into a combo dorm/retail center, a la Dobie Center, so we could have something to compete with Austin in the 1990s, plus it would've filled in for any fast food establishments that WEREN'T on Northgate already. The downside to doing so would that it still would've been far away from the rest of Northgate (a long walk down past the University Apartments). Maybe it's best to just let life go on as normal. EDIT 15 (July 2014): Updated parts about the Leonard Ross ownership, renamed post from "From Ramada Inn to Rubble", smoothed out some portions now that it's not 2012 anymore. I sent some photos to your email of the remains of the tower from last week. Do you see where the 2 existing hotels (hampton & Knights) fit into that plan? They, and Applebee's, are not part of the property.